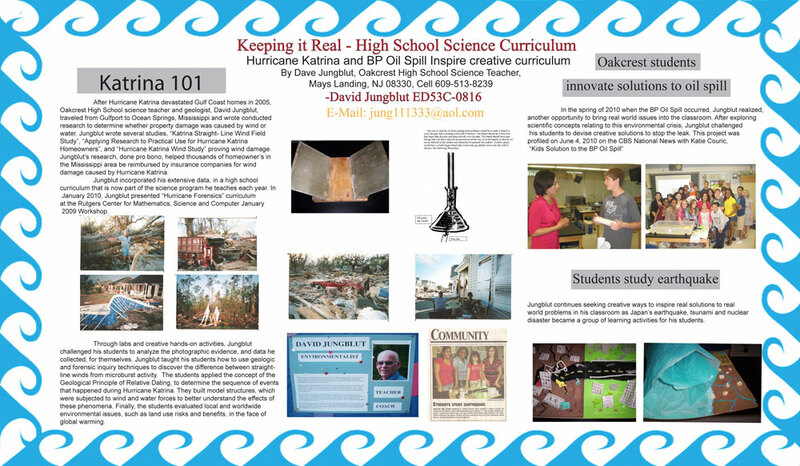 After Hurricane Katrina devastated Gulf Coast homes in 2005, Oakcrest High School science teacher and geologist, Dave Jungblut, traveled from Gulfport to Ocean Springs, Mississippi and conducted research to determine whether property damage was caused by wind or water. Jungblut wrote several studies, “ Katrina Straight-Line Wind Field Study”, “Applying Research to Practical Use for Hurricane Katrina Homeowners”, and “Hurricane Katrina Wind Study” proving wind damage. Jungblut’s research, done pro bono, helped thousands of homeowner’s in the Mississippi area be reimbursed by insurance companies for wind damage caused by Hurricane Katrina. Jungblut incorporated his extensive data, in a high school curriculum that is now part of the science program he teaches each year. Jungblut presented “Hurricane Forensics” curriculum at the Rutgers Center for Mathematics, Science and Computer January 2008-2009 Workshop. Through labs and creative hands-on activities, Jungblut challenged his students to analyze the photographic evidence, and data he collected, for themselves. Jungblut taught his students how to use geologic and forensic inquiry techniques to discover the difference between straight-line winds from microburst activity. The students applied the concept of the Geological Principle of Relative Dating, to determine the sequence of events that happened during Hurricane Katrina. They built model structures, which were subjected to wind and water forces to better understand the effects of these phenomena, Finally, the students evaluated local and worldwide environmental issues, such as land use risks and benefits, in the face of global warming. In the spring of 2010 when the BP Oil Spill occurred, Jungblut realized, another opportunity to bring real world issues into the classroom. After exploring scientific concepts relating to this environmental crisis, Jungblut challenged his students to devise creative solutions to stop the leak. This project was profiled on June 4th, 2010 on the CBS National News with Katie Couric, “Kids Solution to the BP Oil Spill” continues seeking creative ways to inspire real solutions to real world problems in his classroom as the Japan’s earthquake, tsunami and nuclear disaster became a group learning activities for his students. It is a misconception that when teachers incorporate research into their classroom that they are unable to cover the necessary, required curriculum material. To the contrary, when working with real scientific data, students are in fact exposed to more material, not less. Here, the scientific method is used as a flexible tool – inspiring and helping students to properly order their thinking processes. Through Princeton’s Program in Teacher Preparation, and specifically the QUEST program, teachers are taught two very important tools towards leading research-based classrooms; reflections and inquiry-based questioning. In particular, these skills allow teachers to bring research into the classroom year after year, building their students research prowess and critical thinking skills. 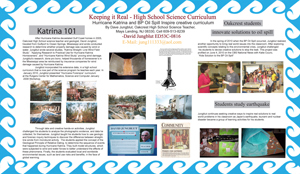 A QUEST graduate, Mr. David Jungblut, will present how he has incorporated reflection and inquiry-based learning into his classrooms studying local storms and hurricanes, such as Derecho, Katrina and Sandy. Through his activity, participants will be guided through question generation and then work together to find the imperative answers about why and how these storms occur and how they can affect natural systems. By teaching how to ask questions and reflect on their observations first, Jungblut has found his students now approach him first with questions after major storms, instead of having to initiate the conversation himself. Students are intrigued to decipher why their homes may have been flooded, while their neighbors remain dry, for example – an answer they can’t find in a textbook or search for online, yet are excited to tackle thanks to the confidence instilled in them through learning the scientific method. 1:15 Teacher/Parent Forum: How to identify individual animals in a group? Why is identifying individuals in a group important? What are keystone species? 4:00 Teacher/Parent Forum: design time—what topics are you interesting in and let’s design a lesson together. American Geophysical Union should be commended for helping to share scientific research with many people.